On Tuesday, November 6th, 2012, when the world was watching the election between President Barack Obama and Governor Mitt Romney, I was focused on a local election. The race for Iowa’s fourth Congressional District between Steven King (R,Kiron) and Christie Vilsack (D, Ames). What started out as a close race, grew further apart and, ultimately, ended in many tears from me, as Steve King was crowned a sixth term as an Iowa Congressman. This was troubling for me, as King is no stranger to the agriculture industry and is not a fan of helping animals in need. In the past, King has been unwilling to support legislation such as the “Pets Evacuation and Transportation Standards Act”, which would have included pets and service animals in disaster planning (such as Hurricane Sandy); the “Animal Fighting Enforcement Prohibition Act”, that made it a felony to transport animals or cockfighting weapons across state lines for animal fighting; and a bill that would make it illegal to take children to dog fights. For any animal lover, voting against Steve King is the obvious choice. However, the election is over. King has won another election and the animals in Iowa are, yet again, pushed to the back burner. Unless those of use in his new district speak up. With Iowa’s new redistricting, Steve King is now responsible for 39 of Iowa’s 99 counties. As an animal advocate, this frightens me. Not only does this give him huge reign over a large part of Iowa, but I fear that he won’t care about the issues that concern me. It is obvious to many of you that my main concern is the welfare of animals, and since King is now my representative, I will be making it painfully obvious to him as well, as should the rest of you. Did you know that over 2/3 of King’s new district is littered with puppy mills? According to a search I did on the USDA website, Iowa’s fourth Congressional district has over 100 large scale, dog breeders (and that is only the licensed ones), King’s home county (Crawford) has 4. This is over 5000 adult dogs (according to the USDA) that are trapped in cages for the entirety of their lives, facing the extreme Iowa weather, with less than adequate food/water and little to no vet care.! That number is outrageous, and the facts make this reality hard to face. As a leader of this district for over 20 years, King has got to be aware of the crimes that are going on in his own backyard. If he isn’t, then we are going to help educate him! 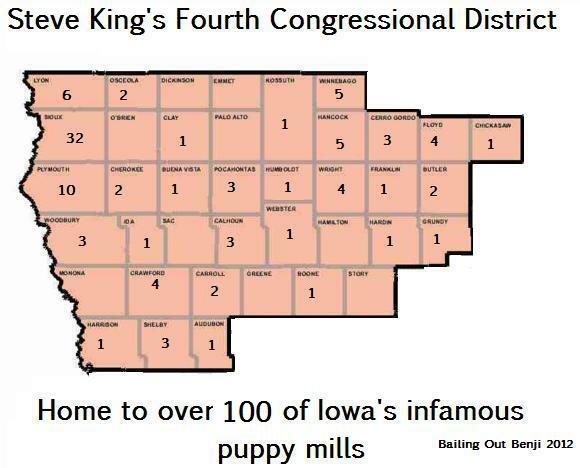 If you live in any of these districts, or just want to help get dogs out of these breeding operations- please contact the office of Steve King and help me educate him on Iowa’s puppy mill problem. We are the second worst state in the nation when it comes to puppy mills, with over 230. ALMOST HALF OF THOSE ARE FROM KING’S DISTRICT! Not only should King be made aware of this problem, he should be the one that is rallying to fix it! I don’t care where you are from, letting him know your thoughts is so important. He dodged a bullet by winning this election, and it is important that we let him know what our concerns are. If you feel more comfortable, please voice your concerns on his facebook page too, the more people that realize this the better! The eyes of the nation are on Steve King now. Don’t let him paint a portrait of us that we don’t agree with. Steve King works for us, we are his constituents, our taxes pay his check! Let him know that we don’t agree the puppy mill problem in his district! Please be sure to “like” our facebook page. And please remember to SHARE this with your friends. If you would like more info on what to say to the Congressman, don’t hesitate to contact me through the facebook page! I will help in any way that I can!!! Also if you could give me the information on the puppy mill in boone i would love to have it. Since I live here now maybe it could be easier for me to do something.